Rating the tracks (from * to ***** for example) is cool, and you can do that in two clicks in Winamp. One method to do that in foobar2000 is the use of the component called foo_playcount (also used for playback statistics). Select the track, then use your hotkey or go in the context-menu (right-click on the track), then Playback Statistics>Rating> and chose your value. Go to Menu>File>Preferences, Display / Context. There you will find the element "rating" in the "Playback Statistic group". Move it in the root folder as on the picture below. 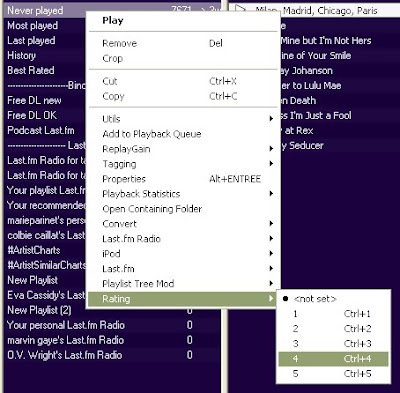 From any of these searches, you can create an automatic playlist by clicking the [...] button on the right of the search field. A list will be created in your playlists, which you can rename. It will update in real-time. This is easy and a good opportunity to introduce titleformatting. To add such a column, right-click on the headers (at the top of the picture above) and chose Columns>More. Which means: if %rating% is present, repeat "●" as many times as the rating is; else, display "o"
Once you got the thing, you can change it, and customize without limits. That's foobar2000! A complete reference for titleformatting can be found here. 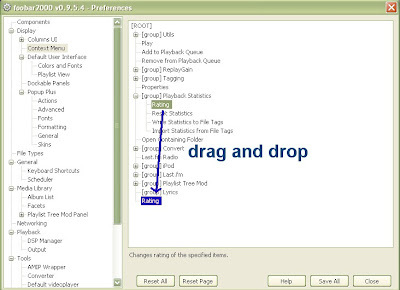 In the context menu of any track selection, just select Playback Statistics>Write Statistics to File Tags. I let you guess what "Import statistics from file tags" does. THANK YOU VERY MUCH for your wellwritten tutorial!!! It makes it possible to sort by rating for a "foobar-dummy" like me. 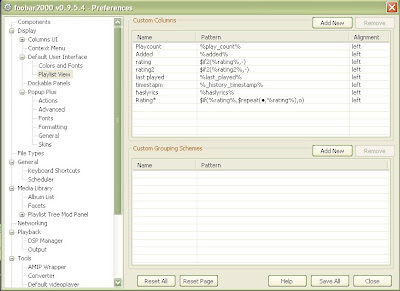 Sice version 1.0 it's not possible anymore to rearrange items in the context menu.